About 5:45 this morning, I had taken Aurora out for her housetraining. She told me several times that she was fine and didn’t need to go out. A couple times she turned away from the backyard and went up the four stairs she’d just mastered yesterday evening just to show me how done she was with the backyard. She’d try to reach the pack members just inside who were taunting her with how comfortable they were inside. Each time I went up to the landing and brought her back into a spot where previous biological activities had taken place. She finally produced, and I let her run up the stairs to go back inside to join the other pack members. Her lightened state apparently enabled her to jump up the final step. Yep. She made it all the way up the stairs into the house on her own. An accomplishment! Crud! We aren’t safe any more! I didn’t expect that the final step would be overcome so quickly! We celebrated briefly, and then the whole pack went to sleep with Geoffrey while I went off to the gym. Later I did have the camera ready for the mid-morning playful attack of the agapantha roots. 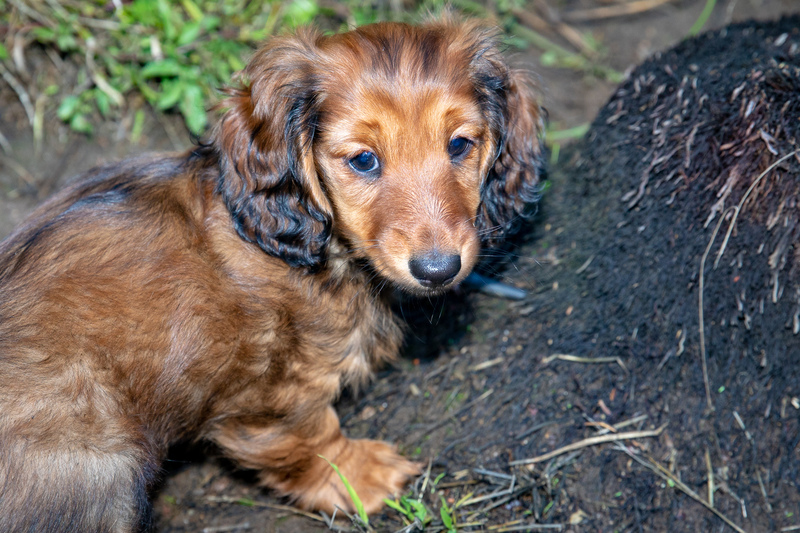 This entry was posted in dachshunds and tagged Aurora, dachshunds, puppies2018, stairs, zenith puppies. Bookmark the permalink.